From the land of South Beach, Heat and sweet jams by Will Smith circa 1998 (ouch. I’m getting old), Miami may not be on the top of your kid-friendly travel list. Good thing “Zoo Miami” (way to go branding geniuses) isn’t really in Miami. I don’t know about you, but when I thought of the Miami Zoo, I’ll call it that because it just makes more sense, I thought of tropical creatures luxuriating in marble waterfalls and sunshine. Turns out that’s not what you will find there, but it is simply amazing nonetheless. The Miami Zoo looks and feels a lot like many of the Zoo’s we have visited up north. Paved walkways, wooden staircases, and sort-of themed outdoor cafes for a quick bite to eat. We visited with a Groupon (see our advice on traveling on the cheap here). For $15 dollars per person (over 3) we received: admission, full day monorail pass, souvenir mug, and two animal feeding experiences. 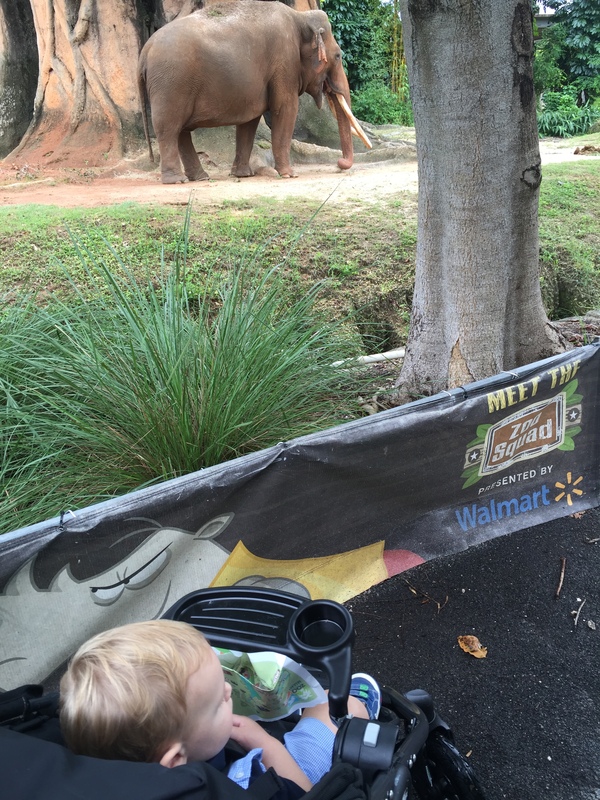 The Zoo is about a 3-4 mile loop with lots and lots to see. I walked it for the exercise, so for kids still in strollers or older children its a nice walk. 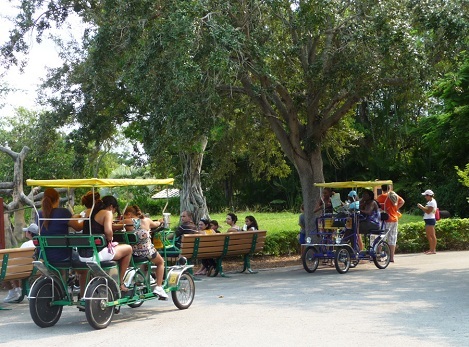 Otherwise, the Zoo rents surrey bikes that looked extremely fun and seat four. The most incredible thing about this Zoo is how close you are to all of the animals. There are no visible enclosures for the majority of the habitats. We walked in the entrance and this guy was right there! Just hanging out. It was incredible to be able to see all of the animals up close. They are also “organized” quite brilliantly for learning. As you travel to different parts of the Zoo, you travel to different continents. So while we loved seeing these Indian elephants, we also got to see African elephants later in our trip. For parents of toddlers, if your little one enjoys “Goodnight Gorilla”, you will be thrilled to find that the Gorilla, the Elephant, the Giraffe, and the Lion were all located near one another. We only missed our friends the Hyena and the Armadillo (they were at the zoo but not in close proximity to the other animals). The absolute best part of our day though was the giraffe feeding. 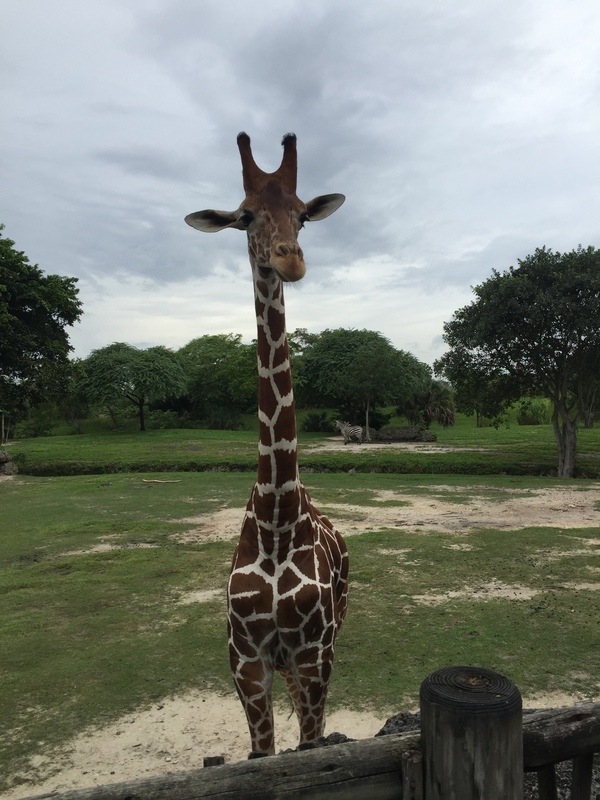 While there was a short line, it moved quickly and we were able to climb an observation deck and feed absolutely beautiful Giraffes. They happily came over to us and the look of wonder on my little boy’s face was priceless. The Zoo is located significantly west and south of Miami. Expect to travel about an hour from Fort Lauderdale or Miami, about 2 hours from Palm Beach. Traffic can be tough so time your trip accordingly. The next time we go, we will make it a stop on the way to the Keys. Can be a fun way to break up a long travel day. They are renovating large sections of the children’s area and some exhibits are closed. Make sure to check Groupon for deals while the zoo is under construction.